One is searching for pristine beach, crystal clear water, no crowd, fresh seafood, then head to Bentota Beach, Srilanka. Bentota Beach is the most beautiful beach that i have visited in my lifetime. The beach is lengthy, one can see miles of pristine sand and clear sea water. The best part about this place is that one can feel relaxation, solitude, complete rejuvenation. Things to do here : lie around on the beach, get a tan, go for a swim. Have a drive for adventure. Many water sports activities are available to try. Eat and drink: One can savour the local Srilankan coconut water which tastes amazingly sweet and refreshing, eat sweet juicy fresh pineapples. Enjoy local delicacies- Srilankan devilled prawns, fish fry, fish cutlets, various Srilankan curries, variety of freshly made breads like : kottu - shredded flat thin slices paratha mixed with vegtarian/non vegetarian ingredients, hoppers (rice flour, coconut milk flavoured pancakes),string hoppers.Various rich dishes. Not to forget the famous coconut sambol which is an accompaniment to the main dishes. For dessert: must try traditional SriLankan dessert which is watallapam - coconut jaggery treacle pudding. 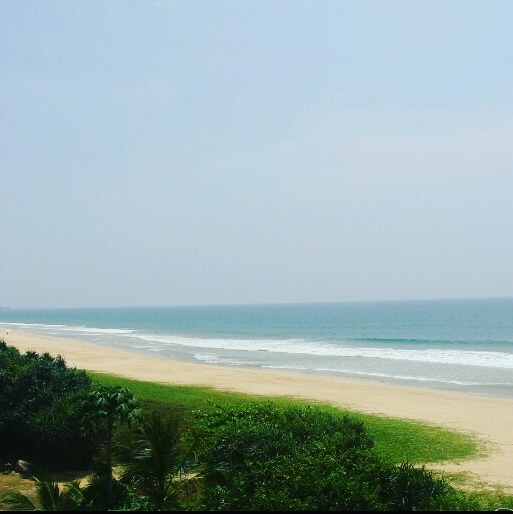 There are many good resorts to stay in Bentota which are beach facing would highly recommend Vivanta By Taj, Bentota Srilanka. One can feel happy holidays vibes in this place. Hope you guys try Bentota, Srilanka as your next beach holiday 2018 destination.